RAISE MONEY EASILY BY SELLING OLIVER'S CHOCOLATE BARS!! 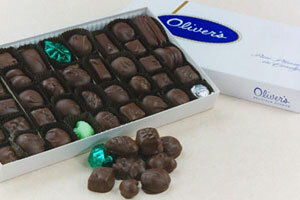 Oliver's chocolate bars are easy to sell because people know our name and our quality. 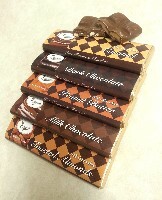 We have always maintained high quality in our chocolates and continue to do so with our fundraising bars. We will gladly help you plan your sale so you do not have any problems, only success! 2.25 ounce chocolate bars loaded with plain milk chocolate, plain dark chocolate, toasted almonds, caramel, crunch or peanut butter. Low minimum ordering starts with 5 boxes of 50 per box. You may pick up your order at Oliver's between 9 am and 9 pm seven days a week. You must be a group or organization. No sales to individuals or families. START RAISING MONEY FOR YOUR ORGANIZATION!